Every rehab my daughter is worse. Can she hide from triggers and drugs? My daughter has been to 3 rehabs. I swear that every time she goes, she gets worse, not better. But I do understand that when she gets out she needs to avoid triggers. So what’s going on here, and how can she hide from the drugs? Attendance at rehabs reinforces all the myths we’ve been talking about throughout The Freedom Model. For example, one of the most common rehab myths that is promoted is that the substance users must avoid all stressful “triggers” that might set off a relapse when they return home after their treatment has been completed. This teaching is predicated on the idea that addicts or alcoholics are too weak mentally and emotionally to deal with any stress without a support network in place when they go home. The users are then given an excuse to avoid all of life’s inherent challenges in their quest for the utopian stress-free existence. This ideal sounds good the first time people go to rehab, especially for those who are already attracted to absolving their responsibilities in life and putting those responsibilities on others around them. But there’s a fly in this ointment. With that teaching, comes a sense of being handicapped and disabled. And, while this might sound attractive at the time, it gets old as those around the users begin to wear out from the users’ lack of responsibility, culpability, and ability and begin to complain. These people are annoyed and angered because they are now expected to carry the substance users’ workload in life. The problem gets worse the longer this idea is reinforced by multiple treatment stays and further family participation in the ruse. You see, the substance users are told to avoid all stressors and triggers because they are weak and simultaneously taught at the same rehab that being high relieves stress. So how do you think this works out in the long run? What do you think about Trump and Sessions pushing for harsher sententing for drug offenders, and especially the death penalty? Sorr, didn’t understand how your site worked. I meant to ask the above as a question. Since it’s actually a comment on the post itself, I think I want to say something else. I can see how your model applies to AA. Previously, I thought of the Freedom Model as not a treatment, but it seems that it is a treatment of sorts since you work to get people to see things differently, and don’t just say, “Stop if you want to stop using” I agree that the expensive rehab system make money for shareholders but is destroying lives and even American society. What if treatment centers used a different model, say HAMS, or SMART or LifeRing for example? Are you familiar with these models? Wait this is still a question isn’t it? No worries, Silver Damsen, we’re happy to to answer. The Freedom Model is an approach and doesn’t use treatment or 12 Step philosophy or methodology at all. Treatment currently uses some form of 12 Step and/or medical coding of substance use as a disease. Providing people with research and facts on substances, addiction, treatment, and recovery so they can make more informed choices and open up their choice options beyond the default choices they have come to rely on while using is not a treatment. We are equally concerned as you are with the exploiting of people’s pain and misery not only through the exhorbitant costs of treatment but also the fact that most treatment doesn’t provide a solution to the problem but merely an expensive temporary band-aid. Patients who go through treatment are taught to see “relapse” as inevitable and to return to the same ineffective treatment models to pay again for more of the same. It is truly tragic the price being paid by individuals, families, and our society in general. As addiction researchers, we are aware of many options for people to choose when looking to deal with substance use. HAMS, SMART Recovery, and LifeRing Recovery are meeting based. These options don’t require lifelong adherence and attendance, total sobriety as a goal, or steps leading to learned helplessness, all of which are marks of 12 Step based programs and treatment. 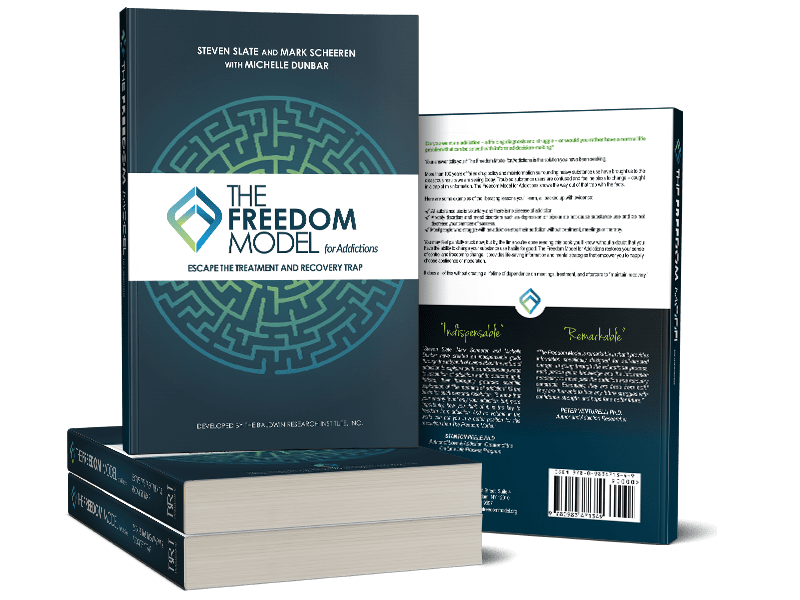 The Freedom Model goes beyond the models you mentioned to debunk treatment and substance use myths and free people from having to seek out meetings, therapy, or aftercare to stay on course by helping them becoming aware of their full range of options, embrace their power of change and choice, and use their free will and new knowledge to determine their own best choices to craft the outcomes and lifestyle they deem best. Certainly HAMS, SMART Recovery, and LifeRing Recovery are less destructive than 12 Steps and treatment. Treatment centers are unlikely to adopt such models as part of the cycle of relapse and recovery which keeps treatment centers full is the learned dependence instilled through attending treatment itself. Substance use is a highly preferred choice which became a habit that excluded other choice options and which can be changed like any other choice. The Freedom Model for Addictions lays out the approach in detail and we offer it as a book, an online option with a certified presenter, or through a residential stay at our retreats, whatever is the best option for a person and hopefully to accommodate every budget. Our hope is to eliminate barriers of access to the material by providing this model at an extremely affordable price and with various options. Please keep engaging and asking questions! We all learn from each other and that only makes us better.